Win the fight against osteoporosis, reduce your risk of falling, and stay active! As long as you’re able to do the activities you want, you probably don’t give your bones a second thought. But did you know that after age 30 you start losing bone density? In fact, women will lose up to 20 percent of bone mineral density in the five to seven years after menopause. And by age 65 men and women lose bone density at the same rate. Sadly, loss of bone mass often ends up causing life-changing fractures. The good news is you don’t have to wait for a fall or break to fight the disease. If you think of your body as a building, your bones are the framing. Without strong bones the whole thing would collapse. And that’s a good analogy for what happens when we don’t take good care of our bones. 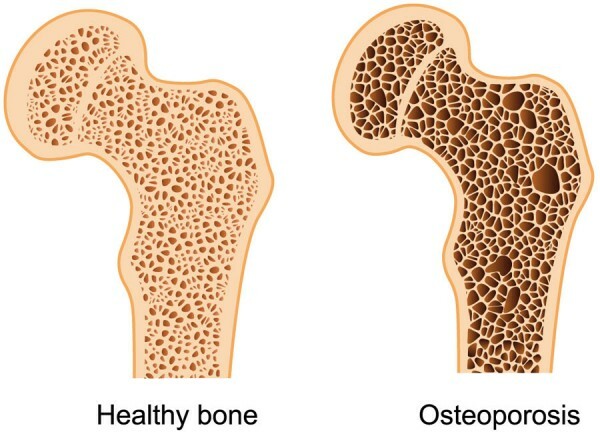 Over time, the body loses more and more bone, until we develop osteoporosis and it “collapses,” in the form of bones fracturing. Here are the tips to fight back with OSTEOPORIS! If you want to build stronger bones, you need three key elements: calcium, protein, and vitamin D. Bones are largely made up of a protein — collagen — bound together by calcium and other trace minerals). Vitamin D helps your body absorb calcium so it can do its job building strong bones. One way to see just how important exercise is to bone health is to look at what happens to bone strength when people don’t exercise. People who have been put on bed rest, people who undergo limb immobilizations, and astronauts, who have very reduced physical activity because of the minimal actions of gravity and muscles pulling on the bone — they all see a rapid and profound effect on the skeletal system. People confined to bed rest for even four months lose about 10% of their bone density in critical regions of the skeleton. It takes a very long time to get that back. Weight-bearing exercise can build about 1% to 3% of bone. That may not sound like a lot, but exercise may also strengthen existing bone in ways that are harder to quantify. Weight-bearing exercises include walking, dancing, jogging, playing tennis. Being physically active, being up on your feet and doing a variety of things. Significant bone loss has been found in men and women who smoke, and the more and longer you smoke, the greater your risk of fracture. Some studies even suggest that secondhand smoke exposure in youth can increase the risk of low bone mass as an adult. Stress reduction can include specific activities aimed at invoking the “relaxation response” such as yoga, tai chi, meditation, massage and prayer. Physical therapy and custom orthotics has great benefits to prevent the onset of oteoporosis. Physiotherapy can help you strengthen your bones, as well as your muscles. It can prevent bone thinning, reduce falls and help you manage any pain. provide appropriate weight-bearing exercises to help improve bone density issues. Folks I hope that I was able to give you helpful insights on how you can better take care of your body.